Ever wonder why no humans have stomped their boots on the moon in nearly 40 years? Well, if you believe the pundits, the answer's simple: Once the race to beat the Soviets to our crater-studded satellite was over, the political will to return (which is to say, the money) evaporated as quickly as tears on a hot griddle. But that's the official story. And there are a lot of red-blooded Americans who make it their life's work to deride official stories. Now Hollywood is catering to the conspiracy cultists by revealing a hideous secret concerning NASA's Apollo program. The ingenious premise of "Apollo 18" (which opened Sept. 2) is that in 1974, shortly after the Apollo program had been cancelled, the space agency sent a trio of astronauts on a clandestine mission to the moon’s south pole. Their ostensible brief was to set up some military radar equipment. The actual purpose was to check out some strange happenings involving alien presence. The guinea pig astronauts were literally flying blind, as they weren't told about the real reason for their lunar jaunt. Indeed, the fact that they had been sent to the moon at all was kept secret from their families, from the public, and — it seems — from tens of thousands of NASA employees. You might think that this last group, at least, would have a "need to know." The movie maintains this clever storytelling artifice with a visual style that mimics video and 16mm film footage throughout, nearly all of it hand-held and relentlessly festooned with scratches, light streaks, sync dropouts, and gate dirt — all calculated to provide that extra dollop of authenticity. Your dad's old home movies are in better condition. 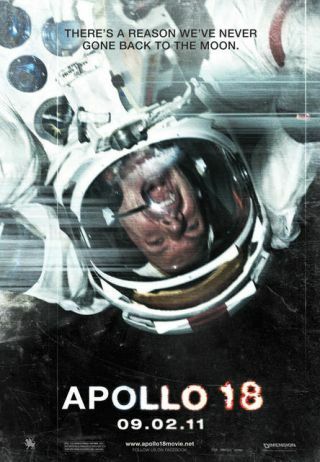 "Apollo 18" is, at root, a haunted house story, in which a small group of basically nice people — temporarily isolated from the outside world — are confronted with cryptic horrors. The aliens who ruin the astronauts' whole day and whole stay are crabby in every respect, and are particularly adept at wreaking havoc at inopportune moments. Mind you, even aside from the obvious question of how this species of crater creatures survives on the moon (What do they breathe? More than that, what do they eat? ), there's always the question of motive. Why are they there and what’s their game plan? It doesn’t matter. This film is a combo platter of "Alien" and "Blair Witch Project," both of which could be faulted on logic, but neither of which could be accused of taking your ticket money without delivering the goods. "Apollo 18” will keep you riveted to your seat (except for those moments when it causes you to rise out of it), even if it does little to further your understanding of planetology or astrobiology. This trip into space is not the friendly, final frontier of "Star Trek," but a tale of horror in which help is a quarter-million miles away. But there's one thing that's got me wondering. Do you think they made this picture using the same movie set used to fake the moon landings four decades ago? Nah. Seth Shostak is Senior Astronomer at the SETI Institute.